This charming apartment is set in Lisboa. Visitors will not be bothered during their stay, as this is not a pet-friendly establishment. 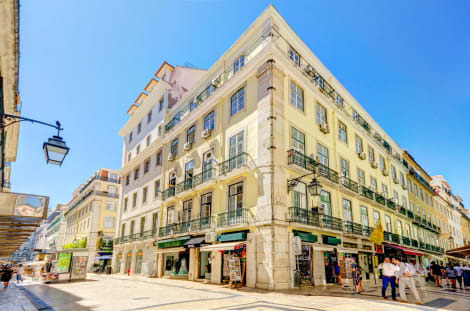 With a stay at Hostel Fly to Lisbon in Lisbon (Estefania), you'll be minutes from Hospital Dona Estefania and close to Castle of Sao Jorge. This hostel is within close proximity of Atrium Saldanha and Saldanha Square.Rooms Make yourself at home in one of the 7 guestrooms. Prepare your meals in the shared/communal kitchen. Complimentary wireless Internet access is available to keep you connected. Bathrooms feature bathtubs or showers, complimentary toiletries, and hair dryers.Amenities Take in the views from a terrace and make use of amenities such as complimentary wireless Internet access and a television in a common area.Dining Continental breakfasts are available daily for a fee.Business, Other Amenities The front desk is staffed during limited hours.